Hall of the Mountain King: Best of 2008: 4. 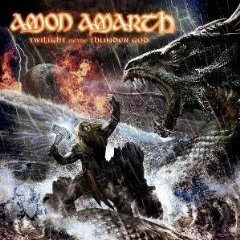 Amon Amarth, "Twilight of the Thunder God"
Best of 2008: 4. Amon Amarth, "Twilight of the Thunder God"
Two years is really too long to wait for another blast of the pure, unadulterated Viking berserker rage that is Amon Amarth. Fans of the band will find few surprises on their latest record, "Twilight of the Thunder God." Still, it definitely ranks among the band's best, even surpassing 2006's excellent "With Oden on Our Side." For those unfamiliar, Amon Amarth comes from the school known as Viking metal, which means their songs are mostly about, you guessed it, Vikings. However, far from being cheesy and cartoonish, the music truly captures the spirit of its subject. It's a harsh and brutal music, but at the same time it can be quite grandiose and oddly beautiful. Just take a listen to the epic riffing that opens "Varyags of Miklagaard" for an example. The songs on the record really capture both the feel of the romanticized version of the Viking life -- sailing over the seas to glory and victory -- in the soaring, epic moments, and the harsh realities of what it must have really been like in gritty and ugly passages. You can feel the spray of the ocean in some of the more glorious moments, and feel the droning beat of the oars on songs like "Tattered Banners and Bloody Flags." I've never been a huge fan of death metal because I can't get into the monotonous grunting of their vocalists, and I prefer strong melodies to speed and technicality. Amon Amarth, while often pushed into the death metal genre largely because of Johan Hegg's vocals, is really a breed of its own. They blend the brutality and heaviness of death with an old school sense of melody. That becomes apparent on numbers like "Guardians of Asgaard," which has a real old-fashioned hard rock vibe at times. They do occasionally follow the death metal formula, as on the album's weakest cut "Where is Your God?," which is the only definite skip here, but that's the exception rather than the rule with Amon Amarth. Their music is about as heavy as you can get, but there's a strong sense of melody that runs through each and every song. You need look no further for it than the title track, which opens the record, to hear the combination. Amon Amarth brings aboard some guest stars for the first time on "Twilight of the Thunder God." Entombed's L.G. Petrov guests on "Guardians of Asgaard," Children of Bodom guitarist Roope Latvala provides a guitar solo on the title track and the cellists of Apocalyptica add some interesting atmosphere to "Live for the Kill." While Petrov and Apocalyptica lend their own sound to the songs, like the Vikings they sing about, Amon Amarth overpowers those influences to make the songs 100 percent their own. "Twilight of the Thunder God" delivers everything you'd expect from the band. Hegg's voice drips with testosterone, the riffing of Olavi Mikkonen and Johan Soderberg is tight and precise, and drummer Fredrik Andersson bashes the skins like they're the skulls of the enemy. It's time to grab the horned helmets and beat your swords against your shields again. Amon Amarth is back, and as good as ever. Get "Twilight of the Thunder God."